Working with the wrists resting on the desk when using the keyboard or mouse. Resting on the wrists AND working with the wrists bent backward when typing or using the input device. Anchoring the wrist to the desk then using the wrist like a windshield wiper when using the mouse. Resting the wrist and base of the palm on the desk or desk edge when typing or using the mouse. Working with the wrists bent to the side when using a conventional keyboard or mouse for a high percentage of the day. 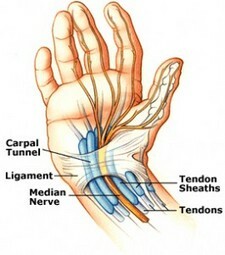 When the wrist is bent backward or the palm rests on a desk edge or hard surface, friction is created between the tendons, their protective sheath and the bones and ligaments of the wrist. Think of it as a string rubbing over the corner of a desk. Over time, the string can become hot and frayed. Similar reactions may occur when we work repetitiously with the wrist in awkward posture. This can lead to wrist and hand injuries over time. Ergo Tip: To protect your wrists and hands, consider installing ‘microbreak’ software such as WorkSafe Sam or Workrave.